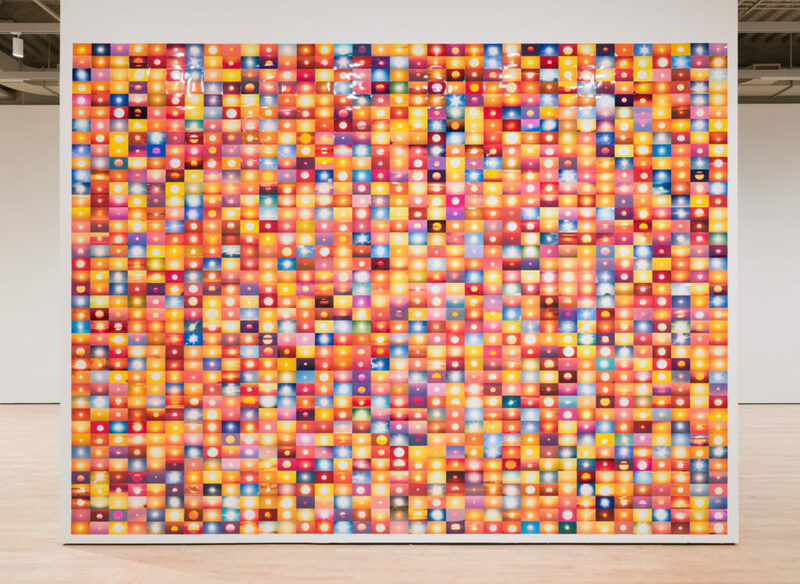 Halfway through the Nothing Stable under Heaven exhibition galleries on SFMOMA’s 7th floor (the show runs through September 16, 2018), visitors encounter an entire wall of brilliant suns—more than one thousand color photographic prints installed in a thirteen-by-eighteen-foot grid. 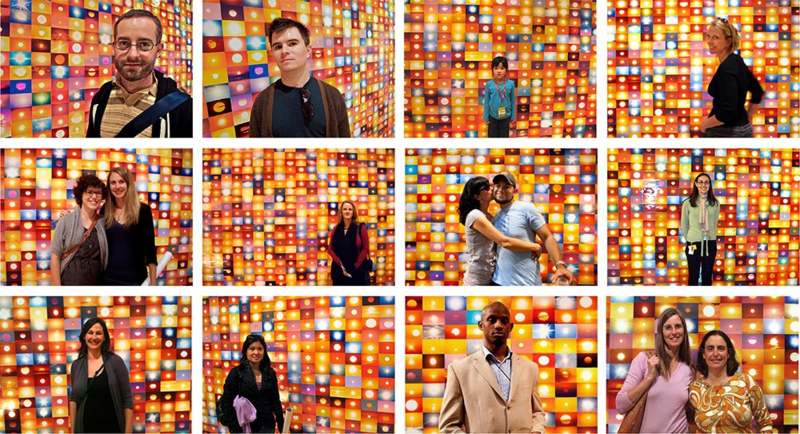 It is the most recent iteration of Penelope Umbrico’s 5,377,183 Suns (from Sunsets) from Flickr (Partial) 4/28/09 (2009). I use the word “iteration” because the artwork differs slightly every time it is installed, which requires a conservator’s involvement to help preserve what is essential to the artist’s intent for the piece. When Umbrico conceived the work in 2006, Flickr was becoming a popular photo sharing site, and she was intrigued by the number of people posting nearly the exact same picture: “sunset” was the most tagged word, with approximately 500,000 hits in 2006 (there have already been more than 35 million in 2018). Umbrico downloaded thousands of sunset images from Flickr and cropped 2,500 of them to focus on the sun. She sold 1,440 of these to SFMOMA. 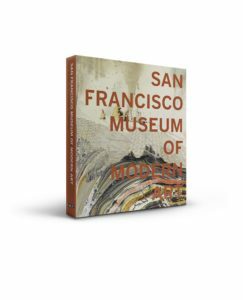 The images that SFMOMA acquired are saved as both jpegs and tiffs on the museum’s digital art server, along with instructions for printing, installing, and deinstalling the photographs each time they’re needed for an exhibition. Each time the work is shown in a gallery or acquired by another museum, the title is changed to reflect the number of sunsets on Flickr on that given day. Interestingly, one allowed variable in each installation of the work is how the individual prints are printed, installed, and deinstalled. 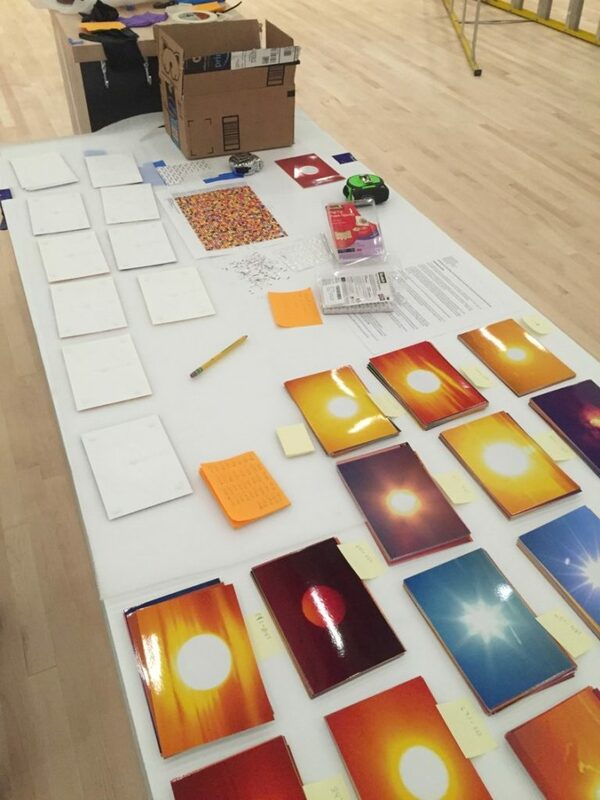 For example, the first installation of Suns… (coincidentally one of my projects while working with conservator Theresa Andrews as an SFMOMA intern) was part of the The Anniversary Show exhibition in 2009–11. The artist supplied the first set of prints and instructed our team to install them randomly in a grid, offering only a minimum height and width for the overall installation. The result was an approximately nine-by-nineteen-foot grid made up of 988 prints affixed to the wall with double-sided tape. The strong tape helped keep the prints well attached during the yearlong run of the show—much longer than a typical time frame for photographs to stay on view, but in this case fine, given that they are printed afresh each time the piece is shown, so cumulative light exposure and even fingerprints aren’t a concern. Following the exhibition, one bag of deinstalled and partially destroyed (thanks to rips from the tape) prints was returned to the artist, at her request, and another was kept in the museum’s conservation studio, now part of the Artist Materials Archive. An unexpected result of the 2009 installation, besides being a topic of conversation during my grad school interviews, was the inclusion of my portrait in another of Umbrico’s works, People with Suns from Flickr (2011). 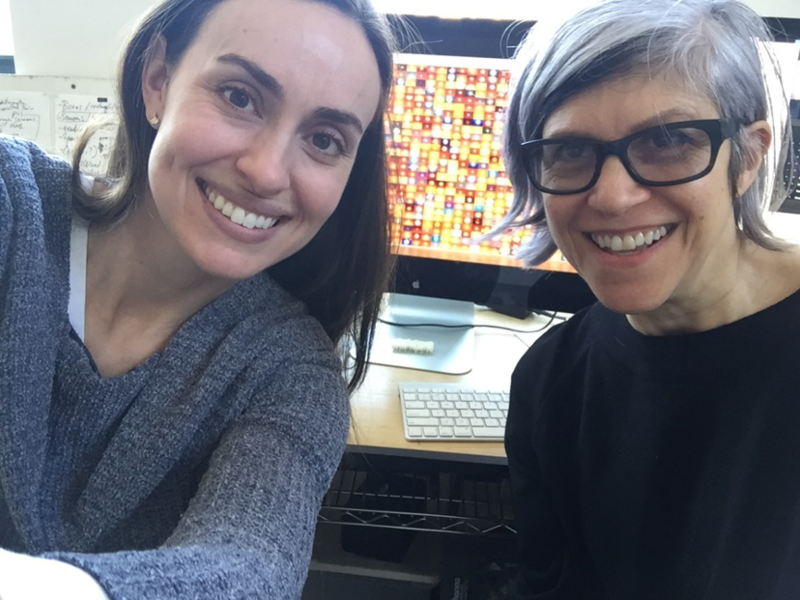 In order to document the finished SFMOMA work, Theresa Andrews had taken a picture of me posing in front of it, which, to make a long story short, Umbrico found while searching the internet for tags of Suns…. I was surprised to discover my instant “fame” when a friend emailed me a picture of the installation during a visit to the Memery exhibition at the Massachusetts Museum of Contemporary Art in spring 2011. He wrote, “Is this you? 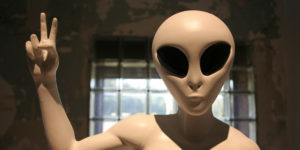 !” It turns out that Umbrico was interested in how visitors were responding to her work, taking pictures as if posing in front of the actual sunset. Although my photo had been shot with a slightly different purpose—to record the fruits of our labor—it still fit within Umbrico’s desire for “recursiveness,” meaning the continual recycling of the same concept and sometimes even the same physical prints in a new artwork. When I saw Suns… on the list of works to be included in Nothing Stable under Heaven, it felt like fate. Not only was I familiar with it from the previous installation, but it had some conservation questions that needed answering, and I was seeking a research project that would align nicely with the themes of my fellowship in the conservation of contemporary art. (I had returned to San Francisco after completing my graduate degree in conservation.) My study would address, among other considerations, the need for a new method to print the images now that Umbrico’s preferred software for managing and ordering them, Kodak EasyShare, is no longer available and businesses that deal in chromogenic prints (the traditional analog color photographic process) are getting harder to find. Suns… was one of the first digitally based works acquired by the Photography Department, so while the intent and specifications for the piece had been documented on the occasion of the initial purchase, many of the museum’s questions and the artist’s responses from that time had proved to be somewhat unpracticed. I was seeking to resolve some of those ambiguities. My first step was to contact the artist. Umbrico was open to meeting to discuss the artwork, and I was already planning a trip to New York, so I traveled to her Brooklyn studio for an interview. Because SFMOMA was the first of four museums to acquire Suns…, and also the first to install it a second time, we were facing some questions that neither we nor the artist had fully considered yet: Do the prints need to be chromogenic, or can they be created with any available technology (for instance an inkjet printer)? If they must be commercially printed, is it important that they’re Kodak branded, and/or made at a one-hour photo lab, as is stipulated in the pre-accession questionnaire? After having installed versions of this piece for the past nine years in various situations and having dealt with other institutions who had acquired it, Umbrico had revised some of her ideas about the work. I learned that the artist’s preferred printing process is “glossy prints from a four-by-six inch ‘mini-lab’ type printer,” and that the New York–based print manufacturer AdoramaPix is one of the few that still prints this way. Umbrico confirmed that, while many of the images are low resolution because of the original file size on Flickr, the specific qualities of the prints are important, and nothing can serve as a substitute for the look of glossy chromogenic prints—the standard, ubiquitous snapshot printing process for decades leading up to 2009. Having machine-cut edges is also a requirement, to keep the prints as precisely rectangular as possible for the gridded installation. We discussed future iterations, when chromogenic prints of the type she likes may no longer be available, and came up with some options for reusing existing prints by either mounting them permanently or carefully deinstalling and removing the tape. In any case, we ordered an extra set of prints to have as a backup for possible failures in the current installation, and will keep them in storage as an “exhibition copy,” following SFMOMA’s practice for labeling artworks produced solely for display rather than preserved as a master copy. While it was proactive to start brainstorming with the artist for possible future scenarios, we realized it was probably too soon to make concrete decisions, given that SFMOMA’s next showing of the work has not been scheduled. Photographic printing technologies will continue to evolve, and the museum staff involved in the decision-making process may change, as may the artist’s vision for the piece. Our efforts should really center on maintaining an ongoing relationship with Umbrico and continuing to document the decisions made around the time of each installation, so that we can keep refining our role as stewards of the work. Every time we revisit the work itself, we will revisit the documentation we amassed at the time of the acquisition; any newly acquired work of this complex nature may involve the artist in a pre-accession questionnaire, an accession summary, a recorded audio interview and written transcript, installation notes and instructions, images, and email correspondence. This body of documentation will continue to grow, with additions by many contributors over the life of the work. Based on the curators’ preference, the 2018 installation is taller than the previous iteration. It features most of the same sun images as before, plus 377 more from our collection of 1,440. The mounting method is new—double-sided sticky foam squares rather than double-stick tape—by suggestion of the artist. All of these details in combination make for a different viewing experience, though one that still fits within Umbrico’s vision. My role in bringing the artist’s vision to life required me to serve as co-producer, ensuring that our choices upheld the work’s concept as well as its tangible, material presence. As my SFMOMA conservation colleagues have taught me, one of the best ways to preserve contemporary art is to exhibit it; in the case of Suns…, this provided the resources and a time allowance to complete a thorough study of the piece and resolve its outstanding issues. Thanks to excellent flexibility and collaboration among several museum departments, and between the museum and the artist, we are now enjoying another successful installation on the gallery walls. 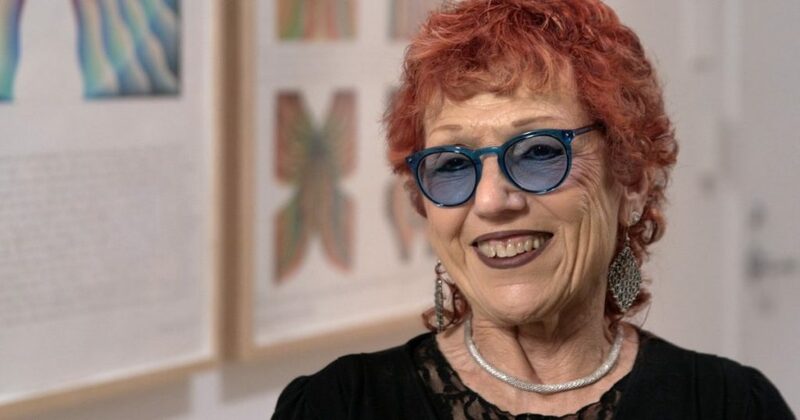 Heather Brown is a fellow in the conservation of contemporary art at SFMOMA.